Yet another example from the students of IIT Bombay proves that innovation and the Indian Institute of Technology are synonymous. 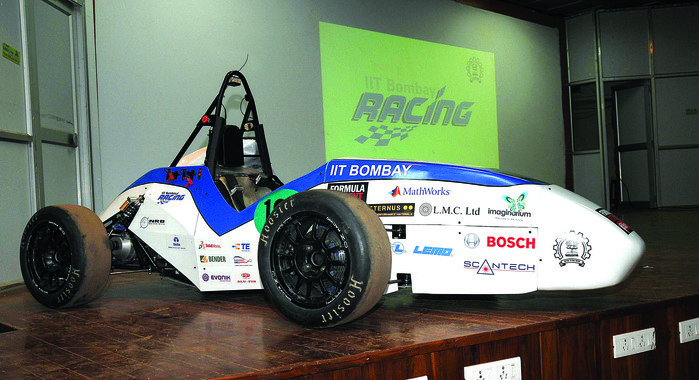 Students of IIT Bombay have revealed EVo 3.0- an all-electric race car which will participate in the Formula Student United Kingdom 2014 at the Silverstone Circuit from July 9-14. The car is powered by a 72kW lithium-polymer battery which supplies power to two DC electric motors attached to the rear wheels. The key highlight is the zip from 0-60 kph in a scant time of 2.7 seconds and a top speed of 90kph. The rear positioning of the battery provides an ideal 60:40 weight distribution. The battery takes four hours to recharge once completely drained. This time the key focuses for the students were to reduce the weight, refine the reliability of the race car and improve the safety. Reduction in the number of batteries from 74 to 26 along with the use of a carbon fibre battery case helped achieve the weight loss aim for the car. The body is made from ABS plastic which has helped in bringing down the overall weight by 90kilos. A couple of years down the line, students even plan to use a carbon fibre chassis. To improve the car’s reliability, students have used high performance connectors from TE connectivity which has helped in reducing loose wiring thereby providing better safety measures as well, much required for the wet conditions in the UK. Inertia sensor in the car cuts off the power in the event of a car crash. Extensive computer simulations have helped design the streamlined body and reduce as much drag as possible, thereby increasing the fuel efficiency as well as performance. The new gear system in the car also complements the lightness of the race car; it uses a fixed ratio planetary gear system as the power from the electric motor is linear and doesn’t require a traditional transmission with many gears. Electronic differential in the car helps control the torque flow well and its sensors collect real-time data which the students can study to gauge its behaviour. The project took the team one complete year and Rs 20 lakh to design. The car has been tested for acceleration, endurance and manoeuvrability and is set to perform at the Silverstone Circuit. The competition is fierce with more than 200 teams registering for the event. Students of IIT Bombay have participated for the third time in the competition. They finished 54th in the last year and are aiming for a top 25 finish in 2014. The way things have been put together in the car and the technical specifications of the evolved race car showcase the praiseworthy job that the students have done. We extend our best wishes to the IIT Bombay team for a zipping performance in the UK! « Difference Between Engineers And Mechanical Engineers!